Callaghan plays piano and guitar and delivers a stunning vocal which earns frequent comparisons with artists like Sarah McLachlan and Emmy Lou Harris. Her songwriting chronicles the stories, experiences and emotions which are part of everyone’s lives. A long-time Shawn Mullins fan, she contacted the Atlanta singer-songwriter through MySpace, and after being knocked out by her music he agreed to a rare collaboration. Callaghan left her London digs and boarded a plane headed for the American South. 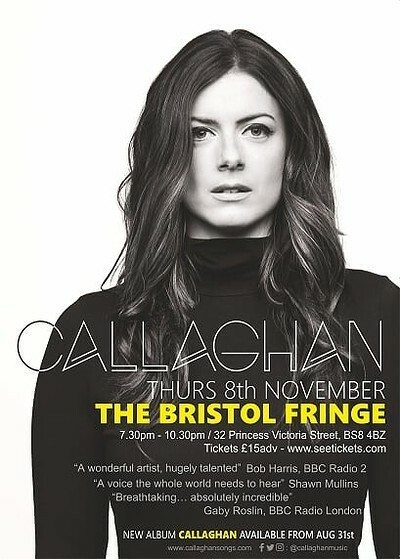 Since then Callaghan has been on the road touring with artists including Shawn Mullins, Ed Kowalczyk, Matthew Perryman-Jones and more. She’s now headlining shows across the USA. A History of Now was entirely fan funded via Pledge Music and was produced in Nashville by Dennis Matkosky. The new record showcases Callaghan’s gift for melody and impactful songwriting in a collection which ranges from uplifting, exuberant anthems to poignant, mesmerizing ballads. A History of Now is available at live shows from January and gets its full release in Spring 2015.